Contemporary Art Centre Reading Room will host Artist Talk with Rupert’s current resident Chloe Cooper this Thursday, 21 November at 6 pm. Chloe Cooper works with people in places to bring about some kind of change. Working across themes of time, space and the affective presence of objects, she proposes something quite improbable to be worked through together. 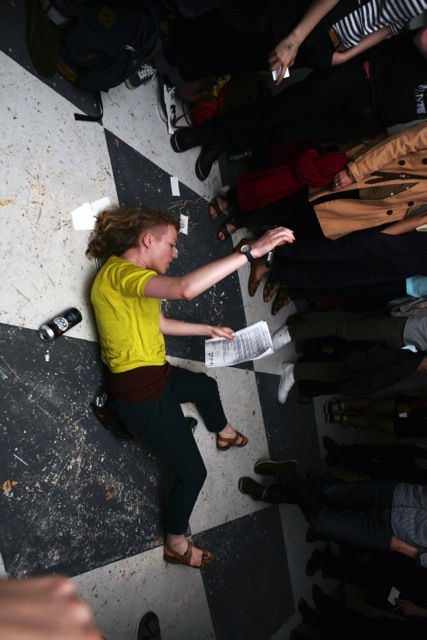 During this talk she will attempt to re-stage and show documentation of her own performative tours, lectures and instructional videos alongside the related work of her peers. Chloe will also talk about the educational contexts in which she works and how they serve as a catalyst to discuss the role of artists in education. During her time in Vilnius as a resident at Rupert, Chloe is working with students at Užupis Gymnasium to test whether the implementation of context responsive performance art practice can momentarily alter the way that people relate to the school as a space and whether this could create a context in which to develop new performances. Find out more about Chloe Cooper here.